Owner of Mankato-based non-emergency medical transportation company going and growing by driving a compassionate company culture. 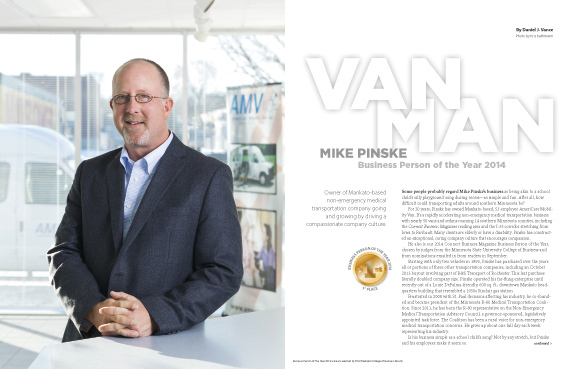 For 20 years, Pinske has owned Mankato-based, 53-employee AmeriCare Mobility Van. It’s a rapidly accelerating non-emergency medical transportation business with nearly 50 vans and sedans roaming 14 southern Minnesota counties, including the Connect Business Magazine reading area and the I-35 corridor stretching from Iowa to Faribault. Many clients are elderly or have a disability. Pinske has constructed an exceptional, caring company culture that encourages compassion. He also is our 2014 Connect Business Magazine Business Person of the Year, chosen by judges from the Minnesota State University College of Business and from nominations emailed in from readers in September. Starting with only two vehicles in 1993, Pinske has purchased over the years all or portions of three other transportation companies, including an October 2013 buyout involving part of R&S Transport of Rochester. This last purchase literally doubled company size. Pinske operated his far-flung enterprise until recently out of a Louie DePalma-friendly, 600 sq. ft., downtown Mankato headquarters building that resembled a 1950s Sinclair gas station. Frustrated in 2008 with St. Paul decisions affecting his industry, he co-founded and became president of the Minnesota R-80 Medical Transportation Coalition. Since 2011, he has been the R-80 representative on the Non-Emergency Medical Transportation Advisory Council, a governor-sponsored, legislatively appointed task force. The Coalition has been a rural voice for non-emergency medical transportation concerns. He gives up about one full day each week representing his industry. Is his business simple as a school child’s song? Not by any stretch, but Pinske and his employees make it seem so. My mom was nurturing, patient, and empowering in terms of building up my confidence. I was an inquisitive young man and remember once asking her about why a particular business wasn’t performing well. Regarding business in general, she said that I should do one thing, do it better than anyone else, and then I would be successful. That’s what I still live by. I do one thing: non-emergency medical transportation. I do it to the best of my ability, which happens to be better than many others. My mother was a huge inspiration. My father was in the construction trade and owned Jim Pinske Construction. He was a self-employed businessman and I saw the dedication and sacrifices he had to make. Being self-employed is a lifestyle. So I was prepared well for the day I would start my own business, which had been an underlying goal of mine even when I was a kid. Yes, such as the endless hours of work, being at the customer’s beck and call, and making sure the job was done right the first time. My dad was constantly working and I get my work ethic from him. He taught me that nothing happens by itself. You have to make it happen. It’s a business owner’s perseverance that often makes or breaks a business. He didn’t give up. I learned that if you believe in yourself, you just keep going. I learned a great deal from him in that respect. Every Saturday morning starting about age 13, I worked for my dad. I pushed a broom, and carried lumber, sheetrock, and shingles. Later on, I drove the dump truck to the dump. It was constant work. I had to work—I didn’t have a choice, even though I wanted to spend time with my friends and do other things. During the summer, work was all summer long. As a laborer, I did everything from pulling wire to laying concrete block. I liked most seeing a building project come together from the initial hole in the ground to being an actual home people could enjoy. It’s a job with a beginning and an end. You can see the progress you are making throughout. And you went on to major in pre-med in college? I did it because I had a compassion for people in general. The idea of being able to help people appealed to me. I wanted to make a difference in people’s lives. That still drives me. I saw medicine as an avenue to accomplish that goal. Sometimes people get into medicine because someone in their past became sick. I just wanted to care for people and make a difference. But my father did die in 1996. He was only 48, which is my age now. He was a Vietnam veteran, a Marine, and his past was a struggle for him. It was alcoholism that got the best of him. So perhaps you saw a progression of what was happening with your father and that was one reason you got into your industry? That’s true. Another factor was my uncle, Laverne, who was developmentally disabled. I had a natural affinity for him. He was so genuine. I never looked at him as having a disability, only as my uncle. So I learned from a young age that all human beings are the same, really. We all sometimes have to lean on others. My uncle just had to lean a bit more. And now you are dealing with your “uncle” again as clients every day. Absolutely. There also was a neighborhood kid who was deaf. I took it upon myself at about age eight to learn sign language in order to communicate with him. Also while growing up in Mankato, there was another neighborhood kid who today works at Hy-Vee. He lived about six houses away. As kids, we would play street hockey or football, and he always was one of the first kids picked because of his athletic ability. I never looked at anyone as being different. Today, I look beyond the physical issues and more towards the person. Everyone has value. You majored in pre-med at University of Minnesota-Duluth. It didn’t work out. I found out I had more of an affinity for business. My compassion to help people—I still am able to do that in this business setting. I feel I have the best of both worlds. I went to Duluth only one year, and then one year at Austin Community College in Austin, Texas. That was a point in life where I just had to break out of the nest. I had to see how far away I could get and be free and break away from hometown and parental bonds. I chose Texas because it was just on a map. The culture is completely different, everything from the terrain to rattlesnakes in the yard, fire ants, and scorpions. People from Texas couldn’t believe you could drive a car out onto a lake in Minnesota during the winter. I came back in 1987 and enrolled at Minnesota State and have been here in Mankato ever since. I took a job at Valley National Bank as a teller for a number of years. As I worked my way through college, I became involved with student activities. They were putting together a credit union for students, and I was able to get on the board of directors. Later, I became the credit union president and operated the credit union about a year and a half, until I had other job opportunities. I had to pay my own way through college. I was taking a full load of credits along with a nearly full-time job—as many hours as I could squeeze in during the week in order to make ends meet. Then you started your own business. Along with Dustin Lee, I started this company in 1993 while still a senior at Minnesota State. I was getting paged out of classes so much to do my job that I accumulated a number of incomplete classes. I left college that year and thought I could go back one day—and here we are. School was fine, but I was so anxious to start doing something. That appealed to me more than sitting in any classroom. My wife was working in a group home setting providing direct care and was an ELM Homes program coordinator. I was out sitting on our porch one afternoon and saw a wheelchair accessible van drive by. I immediately realized I could do the job. That job would meld everything together: my compassion for humanity, my affinity for crunching numbers, and I could be self-employed. My partner and I bought our first van on September 1, 1993. By November, we were up to two vans and two sedans, and by the following September had seven vehicles. The growth since has been constant. We really try to make a difference by providing reliable, good-quality, dependable, and respectful service to people in need that are transportation dependent. And you have purchased three other companies since then? In 1998, Tom Krenik of Red and White Care Van approached us. He was in his early 60s and asked if we would be interested in buying him out. I bought out my partner, Dustin Lee, in 2000. He had been integrated into the community and was able to communicate well with people needing our service. I learned a lot from him how to interact with our clients and be respectful. He had a natural affinity for doing that, and I believe I had the affinity for putting the business model together. The second company you purchased was in 2009, Espeland Vans of Winnebago, and the third, this October 2013, was the far western territory of R&S Transport of Rochester—an addition that strategically expanded your business into the growing I-35 corridor. The owner of R&S Transport, Steven Elwood, and I have been friends and colleagues 20 years. We have collaborated on business issues and served on boards together. We currently serve on the Minnesota R-80 Medical Transportation Board. The “R” stands for rural, and the “80” stands for our state’s 80 rural counties. I’m president of the organization and Steve is treasurer. Due to Rochester’s growth as a destination medical center, R&S decided to focus exclusively on Olmstead County. He reached out to me in May to ask if I’d be interested in buying his operations in Freeborn, Mower, Scott, Rice, and Steele Counties. We closed the deal on October 24, 2013. That effectively doubled the size of our company. So now you are trying to merge two groups that have never been together. That’s where the challenge lies. We now are taking our culture and methodologies for providing service to new employees not familiar with it. My job is to capitalize on what I can learn from R&S’s model. However, I often find through these purchases that our model is already efficient and effective, and so in the past have kept it. I’ve made it clear to new staff to be patient and respectful to all the new clients and drivers transitioning over. Bringing the two together is our biggest challenge. It’s one thing if you could drive all the vans, but you can’t. How do you pass your values onto your drivers? It would seem your drivers are also your salespeople. My model for success has been to take care of my employees, and believe by doing that my employees will take care of our customers. That’s what I’ve done to make sure our culture flows from the top all the way through. As for employees, we look for people with healthcare experience, such as nursing assistants or people that have worked in group homes or cared for elderly parents. We look for people who can demonstrate compassion. The most important client we have is the one with our employee. Because your clients can call someone else. That’s right. When our telephone rings, someone is on the other end with a transportation problem. Our job is to provide a solution. If we don’t, they will call someone else and we may not hear back from them. Our goal is to take care of people, from the entry point into our service until we deliver them to where they need to be. We now have 44 vans, 53 employees, and serve 14 counties. We are busy, busy, busy. Lately, I’ve been meeting with former R&S employees and am trying to make sure I get the name right with the face. Because the President put a one-year delay on the implementation for corporations, that’s something I will be working with my accounting firm on next spring. It isn’t omnipresent on my mind right now, but will have to be addressed before January 1, 2015. We have about 48 full-time employees, and many of them work overtime hours every week. I’m not going to let (Obamacare mandates) be an obstacle to providing services. I look at it as an opportunity to see what’s available in the marketplace in terms of employee healthcare. Gas prices are too high, the industry has gone through rate cuts, and margins are thin. Our culture is just as important as profits. You can’t really have one without the other. We’re going to keep moving forward to do the best we can for the communities we serve. What happens when someone has a life-threatening situation when riding in one of your vans? I get asked that a lot. We are not emergency medical transportation. We are regulated by the Minnesota Department of Transportation. We are not allowed to provide any medical care in transit. In the event someone has a medical emergency, we follow protocols and procedures. In a medical emergency, the driver puts a call into dispatch telling us the problem. Dispatch will send them to the nearest hospital, telephone the hospital to alert them of the situation, and telephone the State Highway Patrol. We’ve had bleeding and breathing incidents. Unfortunately, in any business like this, you also have people that expire while in route. It has happened to us. It’s infrequent, but it happens. And when it does, it must tear you up inside, especially if you personally knew the client. To some drivers, those clients are friends. We get “thank you” letters all the time from people saying things like, “Thank you so much. Dad really enjoyed his drivers, but he passed away last Sunday.” We miss those people. We are a point of connection for many people that don’t have any family members nearby, and we befriend them. Unfortunately, one of my staff members has the daily task of going through the obituaries every day to account for our clients. My youngest client was an 18-month-old boy using a pediatric wheelchair and oxygen and had a feeding tube. It breaks my heart. It tears me up he won’t have many of the same opportunities many of us have. My oldest client is a 105-year-old woman from the School Sisters of Notre Dame. We literally have a 100-year span from youngest to oldest client. Disabilities don’t discriminate on the basis of gender or age. Have you ever approached the City of Mankato to ask if you could bid on all or portions of their city transit system? I have. We have had that discussion several times. We have talked about everything from just handling scheduling and dispatching of their Mobility Buses to trying to provide that service for the City of Mankato. With Mankato’s aging population, its Mobility Bus is being over-utilized. Mankato being part of a metropolitan area now will bring about some changes in the way mass transit is delivered here. I’ll continue to reach out and work with the City to try to partner in providing efficient and cost-effective services. What is your company’s strong point? Our commitment to our communities and clients. I’m not saying other companies aren’t committed, but we empower our employees to be their best. There is no corporate “B.S.” here. We want you to be you. Because when you are you, you will be the best for our clients. We want your compassion and your personality to flourish, because that’s the connection you have with your client. It’s all about relationships. We empower our employees. For example, in bad weather we have what we call a white-knuckle rule. Our drivers are free to pick and choose the days they drive. If they wake up to eight inches of snow, and don’t feel comfortable driving, then I don’t feel comfortable with them driving. It’s at their discretion. I’m not going to force them to drive. We value our safety record. We have some drivers who don’t like an inch or two of snow, but others say the more snow the better. That empowers the employee. Give other examples of your company empowering employees. I’m committed to my family, and I expect my employees to be committed to theirs. We are a family-first company. For example, if someone has a family emergency arise, I don’t want them here working. We step in and pick up the slack as a team to carry the load for that missing individual so they can be where they’re needed most. My employees know they are going to be respected and treated fairly. They know their job will be waiting if they have to attend to more pressing family issues. That’s what I want. They don’t have a family so they can work here. They work here so they can have a family. Family is first. In one instance, I paid for an airline ticket for an employee to visit her son who was injured in a motorcycle accident. If I had a son sitting in intensive care in a California hospital, where do you think I would want to be? I knew where she needed to be. The rest of the staff agreed. She needed to go. We aren’t manufacturing anything here—we’re providing services to people. The thing for me is that I have to provide those services to the friends of my parents and to the parents of my friends. I also have to provide those services to my old landlords, my neighbors, my old hockey coach—you name it. I take that very seriously. Some people argue that you shouldn’t be getting paid so much money by the government to transport people when volunteers or relatives could do that much cheaper. The biggest complaint we get is the cost of our service. A new van costs $40,000. Gas right now is over $3.00 a gallon. We go through 12,000 gallons a month. It’s a terribly expensive service to provide. Given the high cost, I make sure I deliver high-quality drivers using high-quality equipment. And we are respectful. One thing that demonstrates commitment is that if scheduling a pickup for 9:00 a.m., we are going to be plus or minus five minutes. That commitment to promptness has value to a customer. We bill individuals, counties, the State, and pre-paid medical assistance programs (PMAPs). Every client needs prior authorization, including an assessment for the right mode of transportation. We have to confirm eligibility. It is a medical billing and considered a medical service. Our reimbursement rates are set in state statute. You can only change that statue through an act of the legislature. When gas or other costs go up, there is no relief. As a matter of fact, the State in September 2011 cut our rates 4.5 percent. You have to have a barebones operation. We’re pretty lean. It concerns me if we have another rate cut or gas spike we may be too lean, and something too lean doesn’t run any longer. It’s always a challenge. Personally, I live a modest lifestyle. I want to have the best equipment on the road. I continually reinvest. This merger will help us do more. I work with Community Bank Financial Group and Steve Carlson. Steve has taken the time to know me, the business, and our industry. Our bank is a partner. Partnerships are two-way streets. I perform, and they perform. It’s been a good relationship so far. Tell me about the start of the Minnesota R-80 Medical Transportation Commission. I had been involved in the Special Transportation Services Association many years, and served as treasurer twice. It had ongoing legislative efforts, but I saw those more as addressing Twin Cities issues. In talking with rural colleagues, we bounced around the idea of starting our own rural association. The issues are so different out here. For example, we only get paid when someone is in the vehicle. For instance, if we give a round trip transport for someone from Le Sueur to Mankato, we would travel 104 miles a day, but can only bill 52. Companies that do what we do in the Twin Cities have their own set of challenges, but out here those challenges are so much more significant. For example, I serve 14 counties. The Metro has seven counties. I serve an area twice the size of the Metro, and yet we have a fraction of the people. In 2008, we started the R-80 association, which includes seven larger providers. We decided it was time to bring rural issues to the forefront and make sure rural legislators understood the importance of this service in their communities. It’s cost-effective to have a service like ours so people can get to a doctor and not have to be in a nursing home. It’s been a challenge, but rural lawmakers represent rural constituents, understand rural perspectives, and can appreciate the differences outside the Metro. Yes, and we have full-time Capitol representation. The R-80 pushed for the Legislative Auditor to audit the industry for strengths and weaknesses, and to identify problems in the industry. We wanted legislators to get an objective view of our industry. Released in February 2011, the audit confirmed what we had been saying. As a result, the legislature decided to form the Non-Emergency Medical Transportation Advisory Council, which is a governor-sponsored, legislatively appointed task force. I represent R-80 on the Council. We address the issues outlined in the auditor’s report. That keeps me busy at least one day a week. Any industry changes come from the audit? The State in 2006 had decided to hire a broker to manage the administrative aspects of the program. That arrangement did not work out well. Many Metro providers went out of business because the broker would not give them rides. The broker answered the telephone, set up rides, confirmed eligibility, and faxed me the rides. It didn’t empower the clients to make their own decisions concerning which provider to use. It was frustrating for providers and that led to the audit. In 2009, State Sen. Kathy Sheran passed a law prohibiting these brokers from handling higher-level services. Some Metro counties still use a broker for lower-level services. The brokering began in 2006 because many people in state and county agencies didn’t understand the complexity and difficulty of scheduling, dispatching, and running a business like ours. County and state government employees struggling with the administrative aspects of this program decided farming it out was an easy solution. The task force is scheduled to present its final recommendations to the legislature this coming session. I expect meaningful and positive reforms to be implemented by July 2014. You’ve just doubled in size. One person can handle only so much. Have you exceeded your span of control? I believe in delegation. If I trust you, and you have proven yourself, I am going to give you as much as you are willing to take. But I will share the responsibility—I’m not just going to give it away. Delegation frees up my time for other aspects the business. While involved at the state level with R-80, I’ve learned much more about the system and myself. In doing acquisitions, I’ve learned much more about business and myself. With a business, every once in a while you have to turn the ship into the wind. Doing this recent acquisition helps me learn the character of the crew and helps identify our strengths and weaknesses. And it helps me develop a clear set of priorities moving forward. With our most recent acquisition, we turned the ship into the wind. Everybody is digging deep to hold up his or her end of the bargain. What did you learn about yourself doing the three acquisitions? When given the opportunity to acquire another company, my first reaction has been thinking how great the acquisition would be. But there is a lot of hard work involved. Every acquisition of ours has been larger than the one prior. With the latest, there was a lot of due diligence. With the latest acquisition, I often felt like I was reaching my threshold of ability. I learned I’m capable of doing more than I thought I could. I don’t think I will do another acquisition, at least for a while. I believe this industry will see lots of attrition over the next ten years—a lot. Companies will consolidate service territories. There are fewer and fewer companies like ours today than yesterday, and the companies remaining have become bigger and bigger—beyond my scope of acquiring. Education: Mankato West High School ’84, and attended University of Minnesota-Duluth, Austin Community College, and Minnesota State. Family: wife, Karen; two children, Jessica, and Andrew. Thanks Vance for a great story on health care. My wife and I looked into ‘faith based” health care several years ago. We never made the jump, but under the conditions we have today, I would highly recommend it. We (your readers) would like to hear how it works out over the next few months. As soon as you publish this month’s article I plan to post a link to it on my Face Book page so my family can learn more about this. Thanks again for a good article. Thank you very much Daniel Vance for your very inspirational story on Mike Pinske. I want to start my own medical transportation company in the twin cities area adn wanted to get in touch with Mike to see if he would be willing to mentor me. If you could be kind enough to furnish me with his direct contacts. Thank you very much.